Whether they seek hand-crafted antiques or mass-produced pieces with unique personalities, fishing-lure collectors angle for the baits that appeal to them most. Eventually, almost every seasoned fisherman has a lure that gets "retired" from the tackle box and set aside as a collectible. Perhaps there are memories attached to these pieces: good times spent with family or friends; a prize-winning catch that gained our fictional angler a few moments of fishing fame; or that favorite story about the monster fish that got away. Or maybe the lure is retired and favored simply for its look and feel - a fine hand-carved and -painted bait that looks good enough to set up on a shelf and show off. For serious tackle collectors, however, collecting fishing lures and implements is a sport in itself, and the discovery and attainment of a desired lure is every bit as exciting as the stalking and capture of an elusive fish. 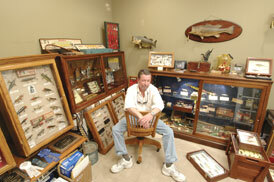 "There are tens of thousands of tackle collectors who participate in the hobby," says John Walker, an avid collector and vice president of Carolina Antique Tackle Collectors (CATC), a six-year-old club dedicated to the collection, preservation and knowledge of antique and old fishing tackle and memorabilia. 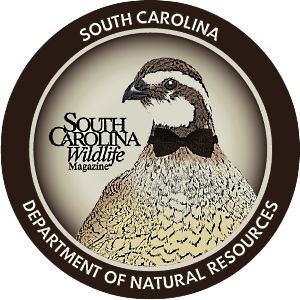 "Or, like my wife, they collect items that have a similar look, such as different color mudbugs or rattletraps, or they collect lures from a particular state or manufacturer. 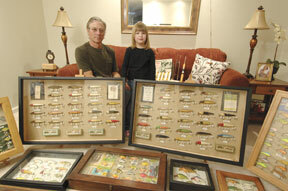 "Then, of course, there are the people who collect antique lures as an investment. 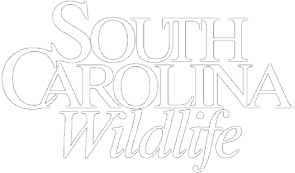 Several years ago, a gentleman from South Carolina paid more than $100,000 for a ten-inch lure known as the Haskell minnow. At the time, it was the most money ever paid for one lure," says Walker. Of course, $100,000 is an extreme amount. Prices for collectible lures can run anywhere from a few dollars up to hundreds and even thousands of dollars. Although certain factors such as scarcity, brand and condition do make a difference, what really drives the price is usually nothing more than the number of people who want an item and what they are willing to pay. Regardless of their reason for collecting, most participants appreciate the cultural and historic value of old fishing paraphernalia. Fishing, of course, is the sport of trying to outwit a fish. And the history of man's attempt to perfect this hobby is as colorful as the lures themselves. 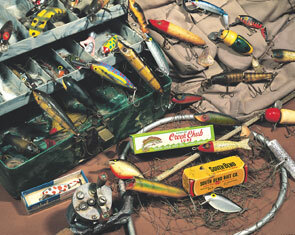 Stories abound about the invention of the first lures. One popular story is about Julio Thompson Buell of Whitehall, New York. Legend has it that Buell, while taking a lunch break from fishing, dropped a spoon into the lake and watched in awe as a fish darted out and quickly ate the shiny, spinning utensil. Buell took the idea straight to the patent office in 1852 and received the first United States patent for an artificial lure. Another popular story is about a Michigan beekeeper and newspaper publisher named James Heddon. As the story goes, in 1898 Heddon was whittling a piece of wood while waiting for a fishing partner. He tossed the whittled piece into a pond and a bass struck the "plug." Heddon's name is recognized as one of the "big five" of fishing manufacturers, which also includes Pflueger, Shakespeare, South Bend and Creek Chub. From the 1900s through 1940s, these five manufacturers dominated the market by creating quality wooden lures that were hand-carved and -painted and often contained intricate glass eyes. After 1940, quality deteriorated as the war, production costs and the use of plastics affected the market. Although plastic lures and metal spoons are often collected, as are many other fishing items such as reels, rods and other memorabilia, it is the older, hand-crafted wooden lures that collectors often appreciate as forms of early American art. "Another thing that can really drive the value up is a human-interest story attached to a piece," Walker says. "Old warriors are lures that have some kind of a story behind them, such as a lure that was bitten in half by a record shark, or anything owned by a famous fisherman such as President Eisenhower or novelist Zane Grey." So, where does one go about finding lures to start a collection? Occasionally, garage sales, antique stores or thrift stores might hold an un-found treasure that was brought down from someone's attic. But these locations get cleaned out quickly by the diligent, serious collectors. For a better variety of lures to choose from, or to sell the lures you have, you can attend one of the many lure and collectible shows held in the United States each year. 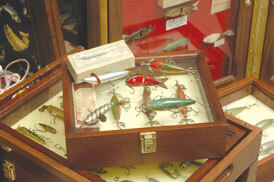 Shows are held by many groups, including lure manufacturers, local tackle clubs or national clubs, such as the National Fishing Lure Collectors Club (NFLCC). Founded in 1976 to foster an awareness of fishing tackle collecting as a hobby, the NFLCC holds fifteen to twenty regional meets per year. At tackle shows, you will not only find lures of every style, color and age, but you will also find many other collectors willing to share their knowledge and to help you determine the value of those prized pieces in your own collection. On a local level, the Carolina Antique Tackle Collectors club is a great place to get your feet wet in this alluring hobby. "The local club started with about seven members back in 1991 as a means to have more organized shows," Walker says. 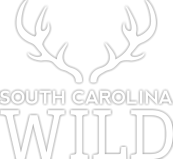 "We sponsor at least two tackle shows each year, one in the spring and the other in the fall. At the shows, collectors come together to buy, trade and sell old fishing tackle and memorabilia, and to share information with anyone new to the hobby." The fun and camaraderie and availability of these shows has certainly added to the popularity of the hobby. But perhaps the most obvious cause for the hobby's growth spurt is the availability of the Internet. If the value of a lure depends on finding a buyer who wants it, the Internet increases the value of every lure exponentially. 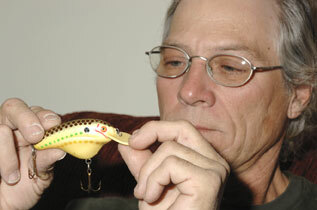 Many lure-collecting Web sites, such as the very popular and locally created site, Joe's Old Lures (www.joeyates.com), provide message boards or other means of posting lures that are wanted or available for sale. And, at the writing of this article, eBay had listings for more than 13,000 items in its "vintage fishing" heading. 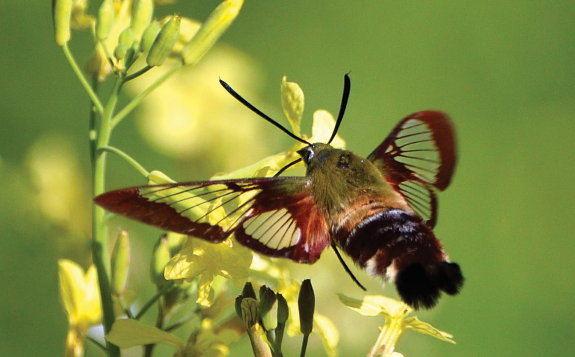 "The Internet has made it a lot easier to find specific lures," Walker says. "But it also really drives the value up on the lures you want to sell. If you go to a swap meet, there may be a couple of hundred people who can bid on your lure. But on the Internet, there is an unlimited number of buyers. It's a hobby on which you can spend as much or as little as you want and still create a nice collection. And it can be enjoyed by people of all ages. I've seen collections where people didn't have a lure worth more than about ten dollars in the collection, and they probably had a collection that was worth seven or eight thousand dollars. "The very old, hand-carved and -painted pieces are really beautiful," Walker says, "but I think some of the less-expensive pieces have an even more important value. "I think the best advice that I can give anybody is, if you see something that you like or that evokes a memory, then that's what you should collect. Collect something that will help you share your memories and your love of fishing - maybe even something that you're not afraid to fish with." After all, what could be better to collect and pass on to the next generation than more fishing memories? Betsy Franz is a free-lance writer specializing in environmental, wildlife, home, garden, how-to and motivational topics. She lives in Melbourne, Florida with her husband, Tom.